20 Feb 2015, Hyderabad, India. XHTMLchamps is a reputed and a leading Web Designing and Development Company providing unmatched services on all Web Solutions, Mobile App Development & Digital Marketing Services. 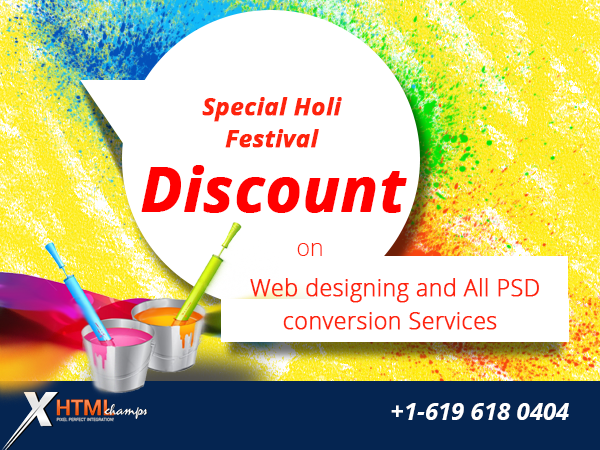 As one of the leading PSD conversion service provider in India, we excel in all PSD conversions project such as ( PSD to HTML, PSD to Html5, PSD to Responsive, PSD to Word Press, PSD to Shopify etc). We ensure that our conversion services will enable your websites to be more user-friendly, elegant, faster and more interactive. We use latest technologies and affirm that the websites will be compatible with all popular browsers. We have a track record of exceeding customer’s expectation and providing visible and positive results with e-commerce and CMS integration services. Our services are risk free, affordable and customized as per the needs of the client. Our work has carved a niche for us globally. We have successfully completed over 8000 projects to our global clients over the past 7 and half years which include excellent Responsive Web Designs, which were efficiently designed and were compatible with all hand held devices. Our experienced and knowledgeable designing, development, testing, marketing and SEO teams strive to provide solutions beyond client expectations and in a time-bound period. Xhtmlchamps was started in the year 2007, in Hyderabad – India as a Web Designing & Development company. The sole aim of the company was to provide quality web services at affordable costs. We have built our reputation as a leading PSD conversion service provider because we take extreme care to analyze our prospective client’s objectives and goals and provide appropriate solutions which result in client’s business enhancement and expansion.